Harold II of England had been with Edith Swanneck for twenty years but in 1066, in order to strengthen his hold on the throne, he married Ealdgyth, sister of two earls. William of Normandy's Duchess, Matilda of Flanders, had supposedly only agreed to marry the Duke after he'd pulled her pigtails and thrown her in the mud. Harald Hardrada had two wives - apparently at the same time. So, who were these women? What was their real story? And what happened to them after 1066? These are not peripheral figures. Emma of Normandy was a Norman married to both a Saxon and a Dane - and the mother of a king from each. Wife of both King Cnut and Aethelred II, the fact that, according to the Anglo-Saxon Chronicle, she had control of the treasury at the end of the reigns of both Cnut and Harthacnut suggests the extent of Emma's influence over these two kings -and the country itself. Then there is Saint Margaret, a descendant of Alfred the Great, and the less well known but still influential Gundrada de Warenne, the wife of one of William the Conqueror's most loyal knights, and one of the few men who it is known beyond doubt was with the Duke at the Battle of Hastings. These are lives full of drama, pathos and sometimes mystery: Edith and Gytha searching the battlefield of Hastings for the body of Harold, his lover and mother united in their grief for the fallen king. Who was AElfgyva, the lady of the Bayeux Tapestry, portrayed with a naked man at her feet? 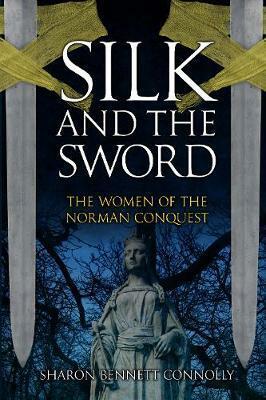 Silk and the Sword traces the fortunes of the women who had a significant role to play during the Norman Conquest - wives, lovers, sisters, mothers, leaders.